This vanity has both an all-around look and a traditional style. With a white marble counter and brown solid wood base, this product is good-looking and useful. Room is no problem with this vanity because it comes with a double-door cabinet and drawers. Make your bathroom look like new with this good-looking, useful set from Wyndham Collection. Bring a fresh, classic look into your bathroom with this vanity. The good-looking white marble counter and brown solid wood base make a big difference in your bathroom. The simple look of the single-door cabinet and drawers is useful and classic. This classic set from Wyndham Collection will make your bathroom look brand new. 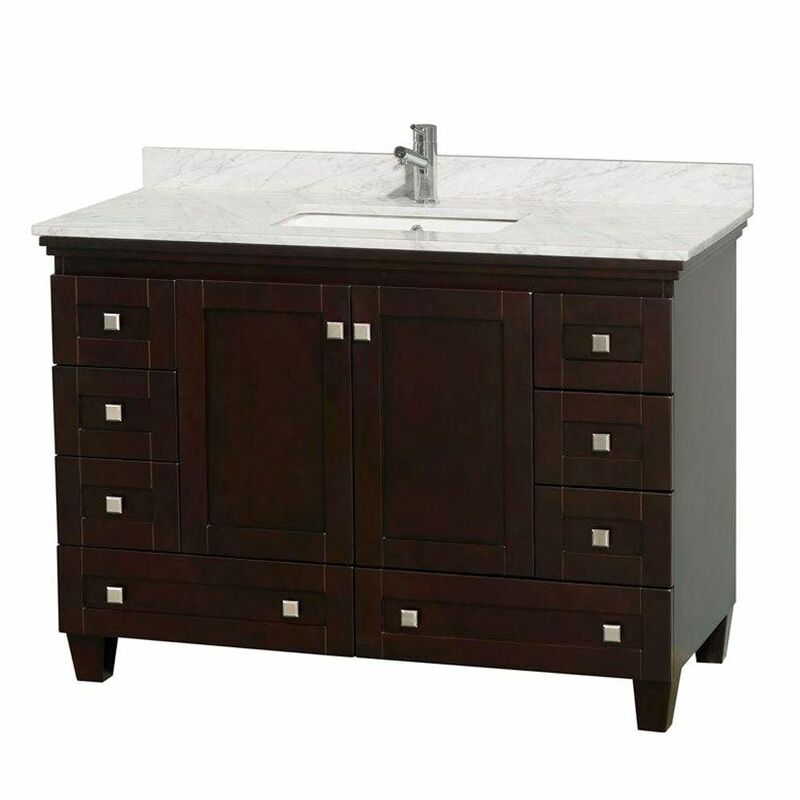 Acclaim 48-inch W 8-Drawer 2-Door Freestanding Vanity in Brown With Marble Top in White This vanity has both an all-around look and a traditional style. With a white marble counter and brown solid wood base, this product is good-looking and useful. Room is no problem with this vanity because it comes with a double-door cabinet and drawers. Make your bathroom look like new with this good-looking, useful set from Wyndham Collection. Rated 3 out of 5 by robb from tight fitting drawers The squared hardware is difficult to grasp to open the tight fitting drawers. Hello. I am inquiring about the depth of the bottom two drawers and if they go all the way to the back of the cabinet when closed? How much clearance is between the back of closed lower drawers and backside of cabinet. Thank you.